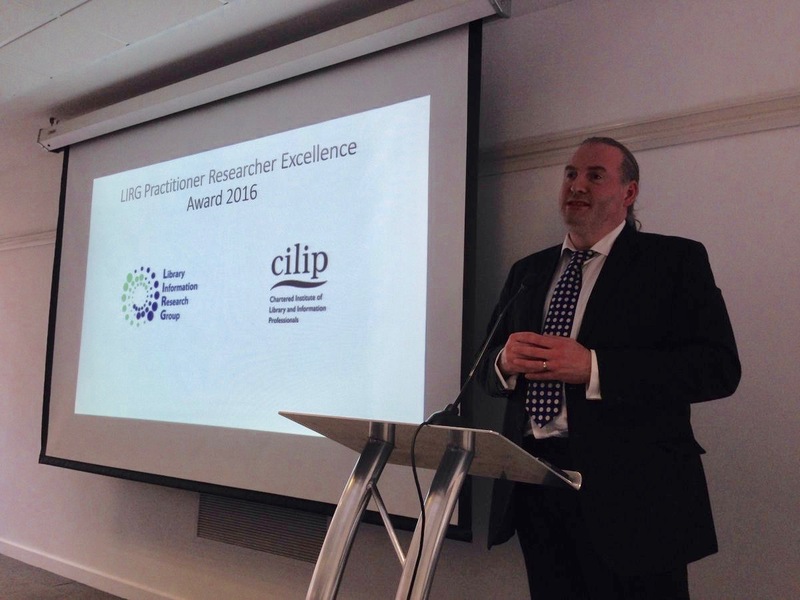 Congratulations to Leo Appleton, who was awarded the 2016 Research Practitioner Excellence Award by the Library and Information Research Group (LIRG) at the Chartered Institute of Library and Information Professionals (CILIP) 2016 New Professionals Day in London last Friday 28th October 2016. Leo is Associate Director of Library Services at the University of the Arts, London, and a part-time PhD student within the Centre for Social Informatics at Edinburgh Napier University, where I am his Director of Studies. This new national award from LIRG builds on one of the initiatives implemented by the Library and Information Science Research Coalition to support practising librarians and information scientists in accessing and exploiting available research in (a) their work, and (b) their own development as practitioner researchers. The Coalition offered such an award in 2012 to recognise the work of an individual or a team that had made a substantial contribution to LIS research in the three year period of the Coalition between 2009-2012. As the person who led the Coalition’s work I am delighted that LIRG has decided to support the Research Practitioner Excellence Award on an annual basis. I am also extremely pleased that Leo is the 2016 recipient of the award. Leo has been an active LIS practitioner-researcher throughout his career. His approach to practitioner research has always been to combine (1) practice, (2) empirical research studies, and (3) his own Continuing Professional Development (CPD) to produce research outputs of value to the sectors in which he has worked. So, for example, in his early career while working as an academic liaison librarian for health studies and midwifery he took a pioneering interest in electronic library resources. By treating information skills sessions as sites for data collection, and exploring one of the UK’s earliest implementations of ebook collections (including their embedding into virtual learning environments), he was able to produce a series of best practice case studies as a contribution to scholarship in LIS. In a later role in further education libraries Leo took this approach on step further by using elements of projects completed as practitioner research to contribute to the award of an MA in Education. He has continued to operate in this way in his more recent roles in higher education at Liverpool John Moores University and the University of the Arts, London. The 2016 Research Practitioner Excellence Award recognises contributions to research excellence in 2015/16. In this period Leo has used the new art and design library environment in which he works as his practitioner research space. Here he has investigated innovative approaches to information literacy in art and design libraries. Recent research outputs from this include a paper at LILAC 2016 in Dublin, and another at UXLIBS II 2016 in Manchester. In 2016 Leo has also been involved in guest editing a special issue of Arts Libraries Journal on these themes. As well as contributing to the literature as an author of conference papers and journal articles, Leo has also served as a peer reviewer of the research output of others. In the past year he has enlarged this role by joining the board of the New Review of Academic Librarianship as Associate Editor. Alongside his on-going practice-based research, Leo studies part-time at a distance for his PhD on the value and impact of the UK public library service on citizenship development. In 2015/16 Leo has been busy collecting empirical data by hosting focus groups with members of the public in local authorities throughout the UK. The anticipated value of this academic work to practitioners is such that he was invited to speak about his early PhD findings in 2015/16 at Internet Librarian International 2015 in London. He has also delivered a number of research outputs to his immediate academic research community at Edinburgh Napier University throughout the year: see, for example, his presentation to the Edinburgh Napier School of Computing Annual Research Student Conference. On the basis of his extensive work and contributions as an active practitioner-researcher and supporter of such endeavours in the LIS profession in 2015/16, it can be seen that Leo Appleton is a worthy winner of the LIRG LIS Research Practitioner Excellence Award 2016. Congratulations Leo! This entry was posted in Awards, Events, PhDs and tagged #CILIPNPD, Centre for Social Informatics, Chartered Institute of Library and Information Professionals, CILIP, Leo Appleton, Library and Information Research Group, Library and Information Science Research Coalition, LIRG, LIS Research Coalition, PhD, School of Computing, University of the Arts London by Hazel Hall. Bookmark the permalink.